Off Western Australia’s coast, Danika Porter goes over the edge and into a spectacular underwater world of creatures great and small. “Go, go, go!” On that command, I plunge into the water and am momentarily blinded by a flurry of fins and bubbles. The snorkel amplifies my accelerated breathing as I frantically try to peer through the foggy waters. A dark form emerges and I realise I’m floundering in the direct path of a shark the size of a minibus. Apparently it is a mere juvenile, but I’m still dwarfed by the seven metres of pure bulk, and I kick furiously to keep pace. The shark is covered with ornate dot patterns as if it’s had a canvas of Aboriginal art stretched over its immense form. Ribbons of sunlight dance over its wide head and tapered body, and its perpendicular gills, carved along its sides, ripple with the current. The gaping mouth hangs open like a sideshow alley clown’s, capturing a microscopic diet of floating sea life, while clusters of suckerfish hitchhike on its underbelly, enjoying an easy feed. ‘Filter feeder’ is a term I hadn’t heard until I arrived in Western Australia. It describes the eating methods of the whale shark and manta ray, respectively the largest fish and ray in the ocean. Both are listed as vulnerable to extinction, yet I’d arrived hoping to not only catch a glimpse of these rare creatures but also swim alongside them. Barely qualifying as a town, Coral Bay is a huddle of accommodation and tour operators on the coast. It’s also the jumping-off point for Ningaloo Reef, best known for the whale sharks that, attracted by plentiful plankton, travel through from March to July. So far this season Coral Bay Ecotours, which sends spotter planes out to guide the boats to deeper water, boasts an impressive 99 per cent strike rate. During our amazing encounter, we rotate in two groups and experience multiple drops with four different sharks before heading back to shore. The sun sets over Coral Bay. 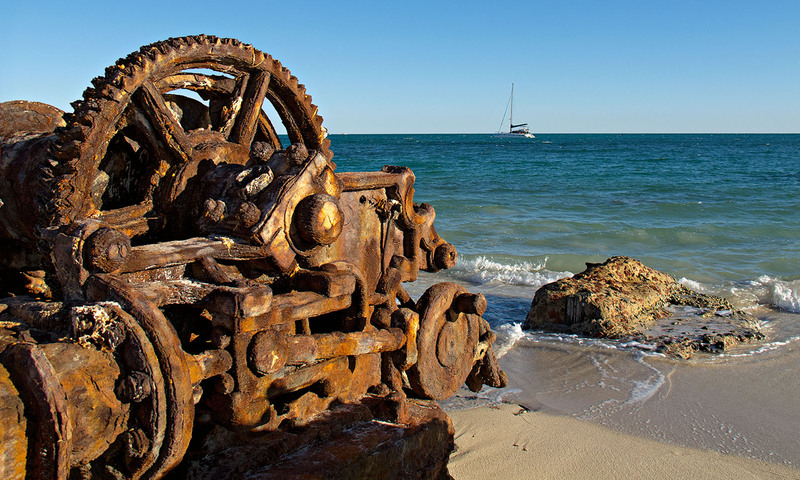 With so many kilometres of reef to explore, however, I abandon land to join Sail Ningaloo on a five-day tour. Its luxury catamaran Shore Thing – crewed by skipper and owner Luke, Travis the dive master/deckhand, and cook ‘Ally in the Galley’ – travels to remote areas along the World Heritage-listed coastline. Soon after departure I grasp a champagne in one hand and a fishing rod in the other. The former stays magically full, while the latter is re-baited for each cast. For the coming days our mission is to get into the water as often as possible. Here, even snorkellers can see the big three: manta rays, sharks and turtles. Normally I’d be terrified to tread water in open ocean, but hand me a snorkel and I naively expect everything to be friendly. Reef sharks, with their black- or white-tipped fins, timidly scatter from my path, before a bulky tawny nurse shark, who seems to be intently circling, sets off alarm bells. The fish – reportedly 500 or so species on this reef – appear to be created from an endless box of moulds and myriad colour combinations. Precise strokes and patterns accentuate the unique body shapes. Sometimes a fluoro dot decorates an otherwise nondescript fish, making it just as striking as one flaunting all the colours of the rainbow. Names like semicircle angelfish, many-spotted sweetlip and butterflyfish are apt descriptions of nature’s handiwork. Near a shallow coral bed a turtle scoots up beside me. It’s so close I can study its tessellated shell and wrinkled fist-shaped head as it moves around me with lazy strokes. I sway powerless against the currents, hoping not to collide with the turtle as its shell grazes my belly. A cluster of bubbles springs from the back of the shell. My rad little friend just farted! Throughout our journey plans are altered by the hour. Sometimes the distance between the shore and the reef is 200 metres, at others seven kilometres, all of which means conditions change radically. When you’re sailing with no agenda and surrounded by a vast undiscovered playground, a typical day runs something like this: breakfast, sail, snorkel, snack, snorkel, lunch, snorkel, shower, sunset, fishing, dinner. Meals become our timekeepers and the food, along with the aromas wafting from the galley throughout the day, is exceptional and plentiful. Warm berry and coconut muffins greet us after snorkel sessions. Chilli mussels, kangaroo skewers and freshly baked bread are just some of the lunch and dinner feasts. Close encounters with a whale shark. Winches on the beach at Norwegian Bay. On day three we reach the remains of the Norwegian Bay whaling station, the tour’s turnaround point and a welcome chance to step on land. Here, when the station was operational between 1912 and 1957, thousands of whales perished in the abundant waters. Whalers drove them into a natural passageway then harvested from the trapped pods. Corroded remnants of the abandoned station litter the beach, and blistered metal buried in the sand glows in the afternoon sun like an art installation. The supersized winches elicit visions of whales being hauled up the ramps to be processed into a mountain of flesh. Off the beach the twisted shells of immense storage tanks, pressure cookers and digesters resemble a devastating plane wreck. It is a haunting place, rich in history but steeped in brutality. As darkness conceals the evidence, it is comforting to know these waters are now a haven for pods of the recovering southern right and humpback whales. My favourite part of the day quickly becomes the end of it. Each evening the sky transforms as we watch from the deck with a glass of wine and a sunset snack. Australia’s west coast delivers some of the most intense sunsets I’ve ever experienced. On our final morning we sail into Mauds Landing and hit the manta ray fast-food strip. Somehow I’d completely underestimated the size and presence of these underwater beasts, and I’m immediately infatuated. The first manta we see gently glides along the seafloor, yet keeping up with it is a losing battle. Its four-metre-wide wings ripple like a Mexican wave and effortlessly contort into stunning manoeuvres. From the helm Luke spots a telltale flash of underbelly – one is feeding. Manta rays gather food by barrel rolling through schools of plankton in a continuous reverse somersault – much like a gymnast tumbling with zero gravity. Freeloading remora fish cling on for each rollercoaster loop. For an hour we are the audience to this graceful underwater ballet that leaves me buzzing for days. Qantas flies daily between Perth and Exmouth. Ningaloo Reef Resort offers beachfront accommodation in Coral Bay. The hotel bar and restaurant is the local hangout. Coral Bay Ecotours departs daily during whale shark season. Tours cost about US$395 a person and include a full day on the water, reef snorkelling, swimming with the whale sharks and lunch/snacks. If you don’t see a whale shark on the first tour, the company offers a free repeat trip. 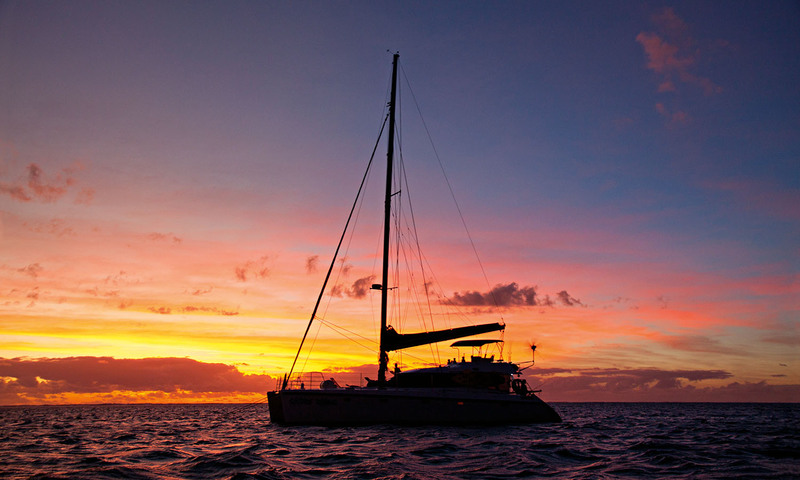 Sail Ningaloo offers three- to nine-night sailing tours, starting from about US$1230, including food, non-alcoholic drinks, snorkelling equipment, wetsuits and scuba tanks/weights.